Lew Sayre Schwartz was one of Bob Kane’s earliest “ghost” artists and all his work was done in the Golden Age. The original Deadshot and the Red Hood are among his credits. Lew was a true gentleman and I was proud to be able to do him a couple of favors while he was still with us. The comp copy of The Batman Annuals, Volume I that he inscribed to me remains a treasured gift. Lew dishes on how things were back in the day, his unvarnished opinions of Bob Kane and the successes he enjoyed post-Batman. Bryan Stroud for Comics Bulletin: When did you first become interested in art? Lew Sayre Schwartz: I’m told when I was about five years old. Schwartz: No. I recall a lot of excitement, very, very early and then I’d say the buds began to show at eleven or twelve. Like most kids, I think, I used to run for the Sunday funnies and I would copy them and the copies I did, I still have some of those, by the way, they were remarkable for what they were. I loved to draw. Since I was…I thought I was fat, let’s put it that way. I wasn’t good at any spectator sports. I didn’t play ball or any of that stuff, so I would sit home and draw. I think the story repeats itself with a lot of my colleagues over the years, but one way to get attention or achieve any status more than likely would be if you could draw, so that’s what I did. Schwartz: Yeah, and it happens that way and then when I got into high school I contributed to the school paper for four years. I was extremely lucky, and this sometimes happens, because there was a young fellow, about a year younger than myself who was also very interested in art and he truly had talent and when I thought Chic Young was a great illustrator and looking at Milton Caniff, well, we became very close friends and there was a mediocre art school in New Bedford where we both went and we’d go to Saturday morning classes there and compare things and I must say that thanks to him I began to see things that developed a case for people like Milton and Alex Raymond, some of the bluebloods, the masters, very early on. Initially I thought Blondie was a great comic. I still do, as a matter of fact, interestingly enough. It’s surprising how that has lasted out its time. CB: Did you ever imagine this would become a career for you? Schwartz: I think that in the back of my mind I had hoped that it would, but I don’t know. 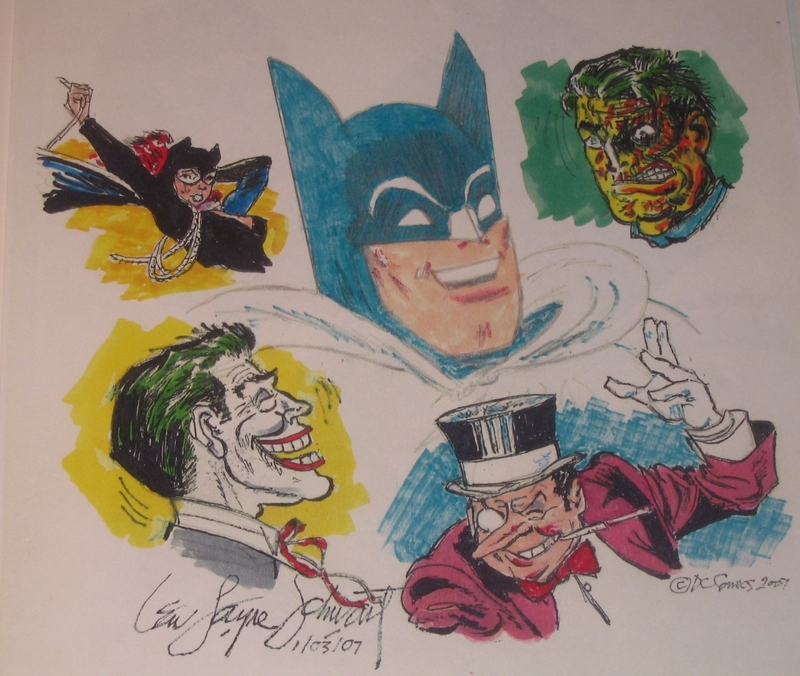 As you probably know, I worked with Bob Kane from 1946 until about mid-1953, but in the middle of ’53 I had drawn the last Batman that I wanted to draw. I had put pages side by side to try and balance the design, page to page, anything to prevent boredom, but it set in very strongly. I was doing a tremendous amount of work for Bob and his contract called for, I think, 12 stories that would amount to 12 pages to a story, so that’s 144 pages and I always did, in the years I worked for him, on average, I would turn out 20 stories. Schwartz: And I had a job in New York working for King Features, but in ’53 I just got bored stiff and with my wife’s acquiescence joined a cartoonist’s junket to Korea, so I spent 90 days with the 10th Army, which I will never forget as long as I live. CB: I’ll bet that was a tremendous experience. Schwartz: The best way for me to describe it, or the way I did describe it is that I spent 2½ years in the Navy during World War II, but the bulk of that had to do with airplanes. I was an aerial gunner. I flew the greater part of that time, not as a pilot but as a radar operator and aerial gunner and so you’re very apart from reality, sitting up in an airplane, unless you get shot at, and getting on the ground in Seoul, and you’ve seen pictures of this modern city. When I was in Seoul, there was not a paved street. They’d all been blown away. There was no glass in any of the major buildings in the city and it’s beyond comprehension in terms of what you see today. CB: I can only guess. CB: No, I’m sure it didn’t. Schwartz: Well, there were all kinds of things that happened. There’s a wonderful little guy, you probably see his name from time to time, Irwin Hasen? Schwartz: We’re dear friends. Irwin was on that trip with me and we had incredible experiences. We were with a communications group and we went over, the cartoonists that volunteered to do this, usually there’d be twelve guys. The oldest they’d leave in Japan and then eight of us went into Korea. Four, they sent down south to where the prison camps were and the other four lucky ones, namely Irwin, myself and two other guys went up with the 8th Army. But being on the ground with people shooting at you is pretty wild. CB: How did you happen to get acquainted with Bob Kane? Schwartz: A funny story. I was discharged from the Navy in April and I had family in Florida at that time. My sister and her husband were living there and I went to Miami after I was discharged before going back home to New Bedford and there was a very pretty lady that caught my eye and there was this obnoxious guy that was trying to hit on her at the same time and I suddenly discovered one day that this obnoxious guy was Bob Kane. Schwartz: Anyway, the girl was nice and said that I was an amateur artist and for whatever reason he asked to see my work and when he looked at it he asked me if I’d be interested in working for him. And lo and behold he said he would call me in the fall and he did and I started to do some things for him. Interestingly enough, very recently, the period of time that I worked with Bob is being archived by DC. I don’t know whether you’ve seen them or not, but they have a Batman archive from the beginning. CB: Yes, I have one of those copies. Schwartz: They have now reached number six, which just started I think to have one of my stories, and when I say one of my stories, I penciled for Bob and of course you’re probably aware that this is sort of a factory operation the way DC operated. There’d be a writer, in many cases that would be Bill Finger, who worked with Bob from the beginning, and not so incidentally, the best scripts that I ever got to work on were Bill Finger’s. Most imaginative. I think, in a way, the most successful because they were so damn visual. He was brilliant and he got no credit. CB: Totally criminal, the treatment he received. I never did a background for him in my life, and in fact when he first hired me it was to work on a joint venture that he said he and Will Eisner were doing. This goes back to ’46 when he first hired me and I was doing pencils and inks on that one. So it just galled me because the way the portrait was painted was demeaning. CB: Yeah and unfortunately, what I’ve learned from talking to some of your other colleagues and so forth that’s very consistent with the way Bob operated. Which is exactly what happened to me. I got out of…first of all the only comic book work I ever did was Batman and I got out of that in ’55, went into an advertising agency and if you’ve read anything that our good friend Will Eisner wrote about sequential art, it trained me for the film business. CB: I understand you were tremendously successful in those efforts, too. Schwartz: Well, I got the recognition that I never got in the comics, and so in ’02 when I was an invited guest to San Diego and got handed an Ink Pot Award by Will Eisner and I must tell you it was a shock. I never expected that. But I had a good 40 some odd years in the film business and it did well by me and I got all the recognition that I didn’t get in the comic business. So strange, you know, what goes around comes around. CB: Yeah, and cream always rises. Schwartz: And you know, it’s amazing to me, every week, well not every week, but I mean every month, certainly, I’ve got at least one or two e-mails from somebody, the last one from Germany wanting commission drawings and it’s a hoot. CB: It’s wonderful. So you still do commissions on occasion? Schwartz: Yeah. You know DC, bless their hearts, I guess they started giving royalties to everybody that did either the pencils or the inking or the writing or the coloring. Even the letterers. Schwartz: Yeah, well they started doing that back in the ’70s. I got a phone call, and this is a funny story, I got a phone call from a guy in Michigan, I think, and he said, “Did you work for Bob Kane?“ and I said, “Yeah, many years ago.“ He said, “My name is so and so,“ and he said DC had hired him to begin to try and get a record of who’s who. CB: I imagine it was a little surreal. Schwartz: Oh it was, absolutely. And then at the end of the tour, he said, “Wait here.“ It was a fun day. I was with a guy who was handling art for Sotheby auctions for comic art and we waited in the anteroom and he walks out and hands me a check for $6,500, (chuckle), which is very nice. CB: Oh, yeah. That’ll make your day. Schwartz: It’s interesting. At that time they were paying 32 bucks a page for pencils, but that same page after 10 years was paying $2.40 a page. It dropped considerably. But the point is I’m not even sure that Marvel pays any royalties. Maybe they do and maybe they don’t. CB: The last time I knew anything, I had the pleasure of talking to Neal Adams about a month ago and of course he did a lot of crusading for artist’s rights and so forth, and on his webpage it shows him receiving a residual royalty check from DC and he was castigating Marvel for not following the example. So I don’t think that’s changed unless it has very recently. Schwartz: Well, there were those guys who were very proficient in that. I remember when I left, I had a staff job at King Features from ’47 or ’48 to ’55, I think and I went into an advertising agency called J. Walter Thompson, which at that particular time was a big gun in the ad business. They hired me primarily because I had drawn Batman and I had, without realizing it, I had been churning out a tremendous amount of product. I’d never thought about it. CB: It adds up quick, doesn’t it? Schwartz: Well, in the course of events, over the last few years, I discovered, I didn’t even know this myself, but I did about 115 of the Golden Age stories. That’s quite a body of work. CB: Yes it is. It’s an impressive amount, especially over a relatively short period of time. Schwartz: Six or seven years. CB: You were quite productive. CB: What did you freelance on? Schwartz: Oh, I did some magazine illustrations and I did illustrations for a number of newspapers, a newspaper feature called “Disturbia,“ for about a year. One of the Sunday sections. I did a lot of stuff. The major thing was Batman, of course. He always complained about it, but he paid me pretty well. CB: I guess so. When I got a note from Shelly Moldoff he said he was just happy to be working. Schwartz: That’s exactly about the size of it. We were happy to have the work. We weren’t very proud of the fact that… Listen, my mentor, as a kid, was Caniff, and this guy was a giant in the business and probably one of the most influential cartoonists that ever lived. Prolific, the amount of work he turned out. Unbelievable. But I would never in a million years tell Milt that I was drawing Batman. That was very demeaning. I remember sitting…where I lived in Connecticut I lived close to a lot of artists, in Westport, all the great illustrators were living in that area. One of my neighbors was a guy named Robert Fawcett. Do you know that name at all? CB: It’s not coming to me. Schwartz: Do you remember the Famous Artist’s School with Norman Rockwell? Twelve famous illustrators, one of whom was Robert Fawcett. Brilliant. He did all the P.G. Wodehouse stories for the Saturday Evening Post and Colliers. All the Sherlock Holmes. Possibly, aside from Sickles, probably the most prolific craftsman and just breathtaking art work. I’m fortunate enough to be able to look up on my wall and I’ve got a couple of his pieces that are just breathtaking. I look at them all the time. Anyway, I was going to tell you a little story. We became, my wife and I, became friendly with Fawcett and his wife and they came to dinner one night. He had just signed a contract with The Saturday Evening Post and he said, “It’s amazing. I have seven million people that see my work every month.“ Now, that’s a pretty good showing, except that I was drawing Batman and there were 20 million. I would have never dared make any comment like that. (chuckle) And so it goes. But can you imagine what a put down that would be? The newspaper strips always had a status, which is again part of my story. When I was going to the Art Student’s League in New York, my best friend was Murphy Anderson, and we both lived at the YMCA on East 63rd Street for a buck a night. Worked during the day. Murphy went into comic book work and I shunned that and I went and became an errand boy for an illustrator’s studio and I would always look down the end of my nose at what Murphy was doing and of course you know with the books he became a super star. CB: Oh, yeah. I saw one of his old Hawkman covers recently sell for I think it was the low to mid-five-figures. I was just dumbfounded. Schwartz: Well that day that I was at DC, Jerry Weitz, the guy handling comic auctions at Sotheby’s and my splash with the Red Hood, I don’t know if you’re familiar with that story. CB: Oh, yeah, I’ve got a reprint of it in my collection. Schwartz: Well that splash, which I didn’t think much of, but that sold, and I didn’t own it, somebody sold it, at the Sotheby auction for $7,500 at that time. CB: Quite a following for those. I noticed you followed some of what Jerry Robinson and others have done with the oversized villain on there. Whose idea was that? CB: Yeah, that Red Hood splash where it showed of course the Red Hood in the background and then a smaller Batman and Robin swinging in. Schwartz: Yeah, you know what, I think that those are instinctive things that you just do. For example, if the medium begs for anything that will make it attention-getting…take the gorilla cover, for example. The Gorilla Boss, do you remember that one? CB: Yes, I sure do. CB: We surely do, and you’re right. Ultimately that’s part of the marketing. You want someone to be curious enough to plunk down their dime or twelve cents. CB: Did you ever actually meet Bill Finger or know him at all? Schwartz: You know, to my regret, I never did. I didn’t know any of the guys at DC with the exception of Jerry Robinson because Jerry was very active in the cartoonist’s society, so I got to know Jerry early on and of course Jerry had worked directly for Bob just before Bob hired me. I’m told that Jerry kept, among the few of us, a lot of that old stuff that he got back. CB: Yeah, that’s what I understand. I think I’ve seen photos of an old Joker splash page that he did and of course I haven’t had the pleasure to talk to him yet, but it seems to me I read somewhere that he claims creation of the Joker and of course Bob does, but of course Bob claims creation of everything. Schwartz: Well, let me put it to you on this basis. At one point I owned page four of the first Joker story and that page was the first appearance of the Joker. I finally succumbed to an offer for it (chuckle) because it looked like an awful lot of money. But Bob, you could always tell Bob’s work because Bob very rarely drew an arm coming out of an arm pit. Arms would come out of the waist. (chuckle) If you look carefully at his work, and I’m sure you know the difference, the timeframe, if you look, you see arms that have fingers spread and the elbow seems to be attached to the waist. Just below the line of committal where the border ends, but the arm would never have come from the arm pit. CB: (chuckle) I think I know what you’re talking about. As I think back, I think I understand exactly what you’re saying. Schwartz: That’s exactly right. Bob…let me put it on this basis. When I was a kid, long before I knew him, I was a Batman fan and I loved the work. And I liked Bob’s work and was drawn to it because it was comic, as opposed to a Neal Adams or any of those guys. CB: Right, not quite as realistic. Schwartz: Getting even further into the blood with Frank Miller, and what a wonderful craftsman Miller is, but, you know, come on. (chuckle) These were the comics, not medical charts. They became so dark and I relate back to one of my influences, who was a guy named Roy Crane. Are you familiar with Roy Crane? CB: No, I’m sorry, I’m not. Schwartz: Well, if you want to learn about the comic business, this is the guy who invented the adventure strip. A book came out three or four years ago giving that credit to Hal Foster, but neither Tarzan nor Prince Valiant were ever comic strips if you think about it. They were illustrated adventures of specific characters and the figures…there was nothing comic about it. Roy Crane, in 1924, invented a comic strip called Wash Tubbs. Roy Crane was the father of “Pop!“, “Sock!“, and “Slam!“ Roy invented it. He was the first one to take sound and put it on a flat surface. He created pop art, unbeknownst to him, but he was that unique combination of an incredible craftsman…he was the first guy to come along and use that chemical Ben Day on his stuff. Roy Crane was the godfather of the comics. You will see the most…well, when I was a kid I wouldn’t miss one of those for all the world. The most inventive, exciting, beautifully drawn adventures of this little sawed-off guy, Wash Tubbs and Captain Easy. They were great stuff. Caniff was the disciple and Crane was one of Caniff’s favorite artists. CB: And he went on to make his own mark, so that says a lot. Schwartz: Well, Crane told me that Hal Foster told him that he used to use his composition, pictorial composition, in Prince Valiant. Even though it was like apples and oranges, Crane always was the comic. Do you remember a strip called Buzz Sawyer? Schwartz: Well, that’s Roy Crane. 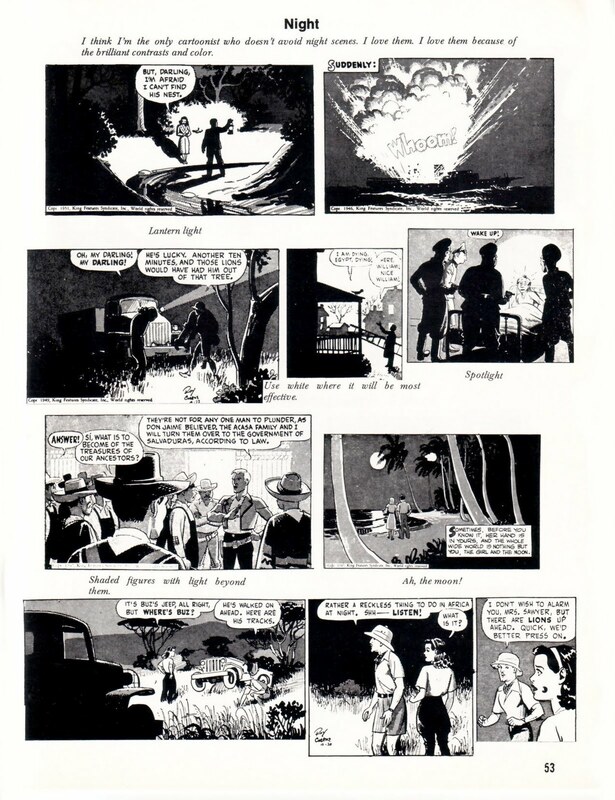 If you look back to the development of the adventure comic, that’s Roy Crane. These guys were just such masters, they’re just great. I twice started a book on Crane and have never gotten a publisher, but there’s just nobody better. CB: He sounds like a most worthwhile study. Schwartz: What had happened was I visited with Crane and I asked about the pop sounds. He was a very shy Texan and I visited with him in ’79 just before he died and he said, “Well, I could show people what was happening, but I wanted them to hear it.“ (chuckle) Isn’t that great? CB: I love it. So a true pioneer. Schwartz: A true pioneer. A brilliant, brilliant artist. And character and story-telling? None better. If you can find them, get them. There were a whole series of reprints done by Kitchen Sink years ago, as a matter of fact. One other thing. Do you have any of the books on the comics? CB: I’ve got a few. Schwartz: Do you have Jerry Robinson’s book? Schwartz: Oh, okay. Because there’s plenty on Crane in that one. CB: Now I do have Julie Schwartz’s and that was interesting reading. You’re not related to him, are you? Schwartz: No and not only that, you know, it’s funny, he was one of the few guys that for some reason…I was at a con, maybe five or six years ago and I introduced myself. He was not friendly. For whatever reason, I don’t know. Schwartz: Anyway, I got that feeling and I dropped it, which doesn’t mean, that since we didn’t know each other, it should have any meaning at all. CB: Yeah, he might have been having a bad day or something, but that’s very strange. Now what about Alvin Schwartz? Was there any connection with him? But one of the people who came to look at that house was a guy named Alvin Schwartz who was, I thought, the writer, and wrote children’s books and I always wondered whether it was the same guy. I have no way of knowing. It’s funny, though, the one I knew, it was a very superficial relationship. CB: Okay, so you didn’t know him well at all. Schwartz: No, but I always wondered when I looked at the products and a lot of the Batman or Catwoman books, you know that have come along since, his name is there a lot, yet I never knew whether it was the same guy. CB: Yeah, that’s a good question and as I understand it primarily his work was on the strips rather than the comics themselves. CB: That’s what I understand. Schwartz: But he was strictly a writer, wasn’t he? CB: I think, but I’m honestly not certain. I tried sending him an e-mail once and never heard back from him. Perhaps I should try again. Schwartz: I can’t help you there.